FIFA have this month confirmed the introduction of a new format for the Club World Cup (CWC). From 2021, 24 teams will contest a tournament featuring a group stage, followed by a knockout stage. This figure is up from the previous seven team tournament, which has largely been an afterthought in the footballing calendar. To counteract this, FIFA President Gianni Infantino announced the moving of the tournament to the summer, eating into the already short off-season break afforded to players. UEFA, the European football governing body joined the ECA in condemning the ratification of the new proposals. “UEFA shares ECA’s view that the International Match Calendar in 2021 does not provide any realistic option to stage a 24 team Club World Cup and that it should furthermore not be played at a time when players should have a well-deserved rest period,” said UEFA. FIFA had previously confirmed fundamental changes to the World Cup, which had been long-suspected of being in the pipeline. Beginning with the 2026 tournament, to be held in North America, the number of participating teams will be increased from 32 to 48. This is the first major change since 1998, when the tournament jumped from 24 to 32 teams. The new format will see sixteen groups of three teams each, instead of the current eight groups of four. Teams will now play only two games each in the group stage, in a move which limits the number of times a nation’s fans will get to enjoy seeing their team play in the tournament. CBS Sport reported that FIFA were projected to profit from the enlarged tournament by $640 million. Traditionalists had already been upset by the decision to award the 2022 World Cup to Qatar, a move which necessitated changing the World Cup to a winter tournament, interrupting the major European leagues. FIFA further recently announced that they will wait until June before deciding whether to increase the Qatar tournament to 48 teams also. The World Cup in Qatar has been mired in controversy from the very beginning, with corruption allegations regarding the bidding process rife. There was also the Amnesty report in September 2018 which was highly critical of Qatar’s exploitation of migrant workers attached to the building of the stadiums and infrastructure required for the tournament. The report went as far as to allege human rights violations, and naturally raised questions of FIFA’s motives in awarding such a prestigious and demanding event to a country as small, and lacking in footballing heritage, as Qatar. We are not so far removed from the 2015 FBI corruption case brought against the governing body, which caused the end of former FIFA President Sepp Blatter’s reign, as well as his banning from involvement in the sport for eight years. Regardless of whether FIFA decides to enlarge the 2022 tournament, 2026 will certainly see a new, but not improved, format. The obvious argument against increasing the number of participants at the tournament is the dilution of quality. The World Cup as it currently exists is a popular and successful format, but even now one can argue that there are some teams which could be charitably described as fodder. This reality is accepted in the face of the greater diversity it also allows, but in an era of globalisation and homogenisation, there are few stylistic differences left between international teams, and so surprises are few and far between. Much like the Champions League, the spread of information and greater technology has shrunk the game, and narrowed the number of teams who can realistically triumph. The increased number of teams will almost certainly exacerbate this issue, introducing more teams who are not at the required level, and will simply play two games and go home. A greater quantity will not add excitement or quality, but rather provide fewer interesting and meaningful fixtures in the early stages of the tournament. There is also the knock-on effect for the qualification stages for the tournament itself. More teams who can qualify necessarily means less interesting races to qualify, and far more dead rubbers during international breaks which already have come to feel like stilted, meaningless diversions. What all of these radical changes confirm is the belief, already widespread, that football’s governing body will happily sell the game’s soul to the highest bidder. The integrity of the game’s traditions is secondary to reckless and thoughtless expansion. The result will be the dilution of the sport’s quality at its highest levels, and the complicating of the fan experience. How can one enjoy the spectacle and the action on the pitch in Qatar, for example, while at the same time knowing the despicable practices and abuses which allowed it to take place? One must endure the arrogant hypocrisy of a body which champions the best qualities of sport for marketing purposes, while engaging, seemingly routinely, in wanton corruption. One of the greatest attractions of the World Cup, and the source of its prestige, has always been its tradition. Historical arguments regarding the greatest teams and greatest players have had a grounding in the uniformity of the tournament. Fundamental changes to the format, and the circumstances under which it is played, negate those comparisons. The latest attempt by FIFA, to enhance the prestige of the Club World Cup, at changing the fabric of the game now threatens a rupture within club football, and puts it and UEFA at odds. None of these moves suggest an organisation which is interested in preserving and nurturing the game in any organic sense. Instead we have the forced, cynical attempt to create false traditions and false sentiment. Sport is best when it is connected in a meaningful way to society, to the people who interact with it. 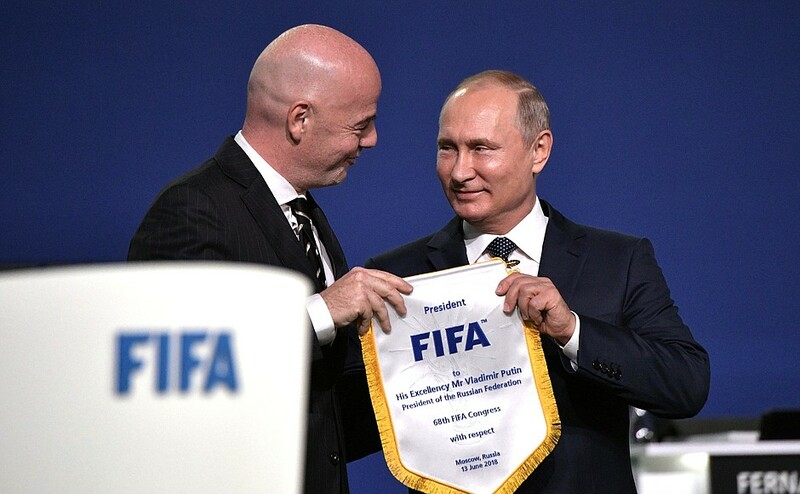 What FIFA are seeking is a greater partnership with those who wish to mine its soul for their own interests, until there is nothing which remains. Dean Hayes is the current Sport Editor of Trinity News. He is a Senior Sophister English and History student.